In the Karnataka Assembly Elections 2018, 83 political parties and independents were in the fray. These included, 6 national political parties, 8 state political parties and 69 registered unrecognized parties. In comparison, during the 2013 Karnataka State Assembly elections, 59 political parties were in the fray. These included, 6 national political parties, 7 state political parties and 45 registered unrecognized parties. This reflects that there has been 41% increase in the number of political parties that contested in 2018 from 2013 says a report by the Association for Democratic Reforms. The voter turnout for the Karnataka Assembly was 74% whereas voter turnout in 2013 assembly elections was 71%. Out of 104 winner of BJP, 53(51%) won with less than 50 % of total votes polled in their constituencies. 48(61%) out of 78 winners from INC; 19(50%) out of 38 winners from JD(S); 1(100%) winner each from KPJP and BSP have won with less than 50% of total votes polled in their constituency. 44(57%) out of 77 winners with declared criminal cases have won with a vote share of 50% and above. 95(44%) out 215 crorepati winners have won with a vote share of 50% and above. All the winners of the Karnataka State Assembly Elections, 2018 won with an average of 36% of the total registered voters. This implies that the winners represents on an average, 36% of the total electorate. In the Karnataka State Assembly Elections, 2013 won by an average of 32% of the total registered votes. Out of 104 winner of BJP, 69(66%) have won less than 40% of votes of the total registered voters in the constituency. 61(78%) out of 78 winners from INC; 15(39%) out of 38 winners from JD(S); 1(100%) winner each from KPJP and BSP have won less than 40 % of votes of the total registered voters in the constituency. Among these 49 winners, 12 winners have won with more than 20 % margin of victory. with 44% margin of victory. 18 out of 215 crorepati winners have won against a non-crorepati runners up. Among these 18 winners, 7 winners have won with more than 20 % margin of victory. Among these, Mr. Yathindra S (INC) from Varuna constituency won with 33% margin of victory. Out of total 94 re-elected winners, none have won with less than 32 % of vote share in their respective constituency. 45(48%) have won with more than 50% of vote share. 21(22%) re-elected winners have won with less than 5% of margin of victory whereas 7 have won with more than 30% of margin of victory. The NOTA button instated by the ECI in 2013 gave the voters an options of rejecting all the candidates in their constituency. 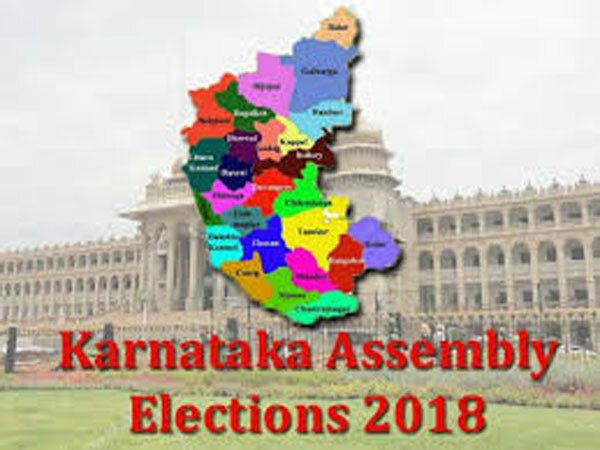 The total number of votes polled for None-of-the-above option were 322841 votes during the Karnataka State Assembly Elections, 2018. Out of total votes polled for NOTA, 22% (70,941 votes) of votes were polled in 55 Red Alert Constituencies. Red Alert Constituencies refer to constituencies where among the contesting candidates, 3 or more candidates have declared criminal cases against themselves.